This post is about how different people react, metabolically, to different foods, especially carbohydrates. How you personally respond to dietary carbohydrate should help you make some decisions about what and how you eat. It gets scientific but the science is important. Several researchers have tried to quantify how we process different types of carbs. These include the glycemic index, the glycemic load and the less known insulin index. These are all really interesting and occasionally useful to tell an individual about how rapidly the carbs they consume are likely to be absorbed into their body and the possible glycemic and insulin response. The insulin index, in particular, offers some promise. The insulin index quantifies the typical insulin response to various foods. That’s great because that’s what’s we are particularly interested in; our insulin response to foods. The alternative hypothesis (also known as the carbohydrate theory of obesity) suggests that high levels of insulin are responsible for us getting fat. I think this alternative hypothesis should be the default one as the most likely mechanism of obesity. I’m basing this on the available evidence and logic through evolutionary biology. This means that the insulin index, in particular, offers some promise. The insulin index quantifies the typical insulin response to various foods and shows some foods will cause more insulin to be released than other foods. The trouble is that the Index is based on the average effect of particular foods on metabolically functional (insulin sensitive) humans, not the specific effect on a given individual. I’m not alone in thinking that individuals vary enormously in their ability to move carbohydrates out of their blood stream into cells. The cells might be muscle, other body, or fat cells. It all depends on your genetics, your age, and your personal eating and exercise history. In other words, depending on who you are and how you have treated your body, you will respond very differently to the same load of carbs. This is nothing new of course. That is the whole point of the Oral Glucose Tolerance test. You drink 75g of pure glucose and we monitor your glucose response over time. More insulin sensitive people will clear the glucose load more quickly. Although not normally measured, we know the area under the insulin curve will be less in these people. Less insulin = more fat burning, less fat storage and a greater propensity to move and exercise. So what about other foods and how we react to them? The conventional advice is to eat more carbohydrates with fibre, especially plant fibre. These are released into the blood stream more slowly. This provokes a much smaller glucose and insulin response, thus the insulin resistant cells of metabolically dysfunctional (insulin resistant) people can much more easily deal with the reduced load, even if the total amount of carbs eaten is the same. That’s why our dietary guidelines at least warn us away from refined (no fibre) dietary carbs and steer us toward “healthy whole grains” and “fibrous” (non-starchy) vegetables. Legumes (beans) are a good example of this. They are absorbed much more slowly. But what if for some people, like those with Type 2 Diabetes, slow digestion simply means high insulin for a longer time? These people have insulin resistant cells. To get any carbs into the cells, insulin might have to be really high. Legumes may not be as bad as pure glucose in causing a high insulin response, but the response may be high compared to someone who is insulin sensitive. So beans might just add to the metabolic problems and make them fatter. So what we should do is feed people a range of different carbohydrate-rich food; from glucose to beans and other things in between. We should measure their glucose and insulin responses before they eat, and for several hours afterwards. How much does the individual’s area under the glucose and insulin curves vary for different foods? How much do the absolute amounts of insulin secreted vary between individuals? How do the insulin curves for the simplest carbs for the most insulin sensitive, compare with the most complex carbs for the least insulin sensitive? Could it be possible that beans provoke a glucose-like response in some, but hey, it just lasts longer in some people? For me, the idea was planted after a conversation with well-known and highly respected nutrition expert and endocrinologist, and a mentor to me, Professor Jim Mann. For those of you who don’t know this guy, he is simply a legend in New Zealand public health medicine. His contribution has been and is massive. He is clearly way more experienced than I am in public health nutrition. I have a huge respect for his knowledge, and a readiness to learn from him, but also I hope to generate some healthy debate at the same time. Anyway, our conversation around carb metabolism was a little bit awkward. After all, Jim really goes for the “plenty of plant-based carbs, low saturated fat, lean protein” diet. To be fair, he certainly promotes the importance of at least some fats. Anyway, despite some differences in the starting hypothesis, what I think I finally got down to was Jim’s assertion that “more complex carbohydrates, like legumes, are digested in the small bowel and have been shown to have lower glycemic and insulin responses”. Fair enough. I just don’t know that much about beans. So Catherine Crofts (a doctoral student) and I planned a study to test this. We want to know if high loads of carbohydrate are OK as long as they are absorbed slowly? It will hopefully allow us to understand more clearly how individuals could be metabolically profiled, at least for their response to carbs of different sorts. Of course, any scientist starts by reviewing the literature in the field. And so be it. Talk about having to hunt for research papers. Catherine, also a pharmacist sick of handing out diabetes medication, has been an absolute legend at digging up research papers on carbohydrate metabolism. I think she had reviewed some 1600 papers at last count. Then she found this little cracker from 1989, only cited 18 times since. These citations all, in my view, incorrectly cite what the original researchers actually found. People citing this paper all claim that the glycemic response to beans is so good in diabetics that we should all start eating more beans (the data shows the opposite in fact). 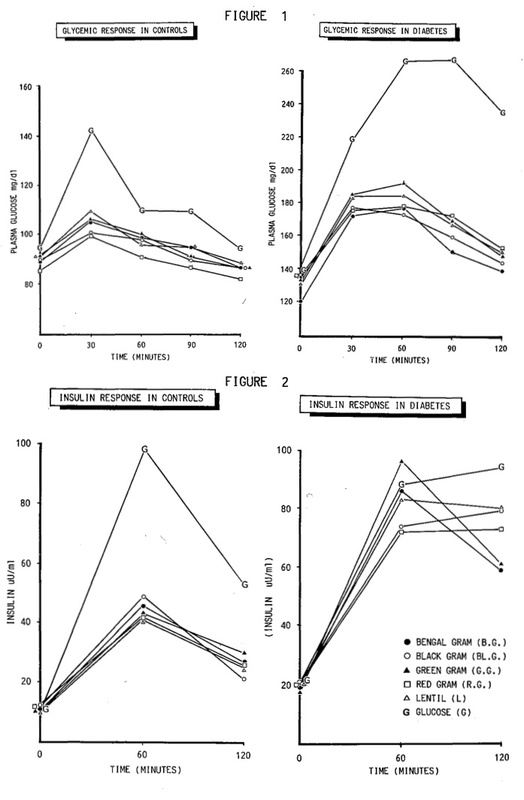 Their data (see figure below) shows the glucose (top panels) and insulin responses (bottom panels) for healthy controls (left panels) and type 2 diabetics (right panels). The glucose units are not matched on the upper panels – they show that the glucose response to BOTH legumes and glucose is much higher in the diabetics. The area under the insulin curve for the legumes is comparable to that for glucose for the diabetics. The insulin curve for the legume-fed diabetics is high and still high at the conclusion of measurement at 2 hours. Also, the insulin curve for glucose and one of the lentils is still climbing! On the basis of these data, I think we have a case for our study and questioning why we would expose people with insulin resistance to large loads of carbohydrate ever. Surely the logic is faulty? It is as I see it, faulty logic because while some carbs do get absorbed more slowly from the intestines into the bloodstream, the cells still need large amounts of insulin to get the glucose into the cells. Insulin is a metabolically useful hormone, but chronic hyperinsulinamia (insulin is high all the time) isn’t good for you. Promoting even “healthy carbs” in larger loads may not be good for the most metabolically vulnerable. They raise insulin, they raise it high, and for a long time. That’s a poor combination because fat burning is off, and fat storage is on, for a long time. Something a little more metabolically benign, say cheese, although higher in calories, won’t stuff your hormonal energy regulation up nearly as much. Eaten on their own, beans could make you fat. Cheese, well we still need to look at how insulin responses vary. Cheese has zero carbs, some protein and some fat. We probably do get a smaller and shorter insulin response to the protein in cheese. We should test cheese! Data from Viswanathan et al, Nutrition Reports International (1989) RESPONSES TO LEGUMES IN NIDDM SUBJECTS: LOWER PLASMA GLUCOSE AND HIGHER INSULIN LEVELS. Great work man! Keep it up. Thanks for your encouragement, I like your work! If you really did want to slow the absorption of a starchy carbohydrate food, you would eat it with fat. Add some protein and some acetic acid, you will lower its GI even further. Much more than you could do just by choosing a low-GI carb option alone. Add enough fat and protein, you won’t even need the carbohydrate! Now there’s a thought. Hi Grant, What you’re missing here with this analysis is the beta-cell accommodation that many diabetics and pre-diabetics can make over time when they replace dietary fat with legumes, especially if the diabetes has not progressed too far. I’ve experienced this first hand and seen it with others. What your analysis also misses is that the legume fiber feeds the microbiome which in turn feeds butyrate ti the diabetic – at a ZERO METABOLIC OCST. It seems to me, that if people ate more beans and less bread, for the same total amount of dietary carbohydrate, they will be less likely to develop type 2 diabetes. 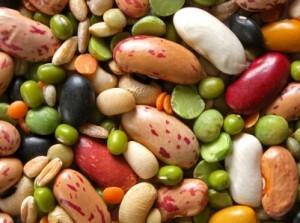 The problem is that current government guidelines present legumes as an alternative to protein foods – if people follow this advice, they will eat legumes in addition to bread, pasta, rice, and instead of dairy, meat, eggs, and fish. Once people have developed T2DM, and that advice is not going to prevent this at all, then eating legumes is relatively useless as a treatment, because, as this post shows, if you are carb intolerant, carbs will out. Population guidelines should focus on replacing as much bread /rice /pasta /potato with beans /lentils /chickpea as is practical, as well as reducing carb intake overall. Diabetic guidelines should focus on getting carbs down, not on dubious switcheroos of carb for carb.